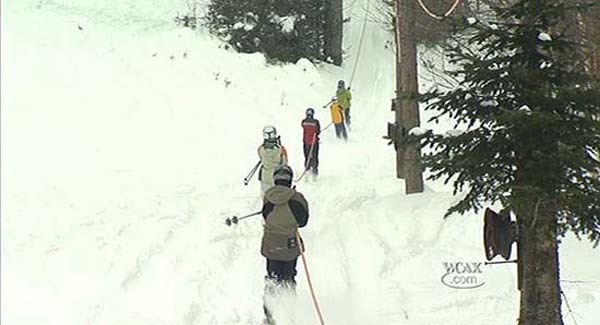 Located north of Greensboro in the Northeast Kingdom of Vermont, the Gebbies' Maplehurst Farm has been home to alpine skiing for decades. Skiing on Gebbies' Farm likely dates back to 1960, when Donald and Madeline Gebbie started a small rope tow operation on their farm. Donald Gebbie Sr. died in 1980, while Madeline passed away in 2013. Their son Peter, who grew up skiing at the area, eventually took over ski operations. Gebbie's Maplehurst Farm was registered as a Vermont corporation in 1990. Primarily a dairy farm, Maplehurst made headlines in 2012, when the Gebbies leveraged funds from Natural Resources Conservation Service, Department of Energy and Vermont Department of Public Service's Clean Energy Development Fund to install a digester, allowing them to generate power from manure. Peter and Sandy Gebbie continue to operate the ski area on Pete's Hill the northwest side of the farm for friends and family when natural snow allows, operating one or two rope tows with their tractors. "We had 4-H gatherings there in the mid 1960s. I was a member of the Gay Green Clovers with Jan Zeller as our leader in Newport. My binding broke and Mr. Gebbie took me into the barn, cut some strapping, and fixed me up. I remember the rope tow was run by an old tractor up on blocks, probably in 1st gear. One time, one of the boys, probably Peter, shifted the tractor into a higher gear, and it would launch you into the air. I still tell that story😁"
"This farm is where i met the love of my life ,Susan ." "1966-67 came over from cutler academy craftsbury after school great fun !"